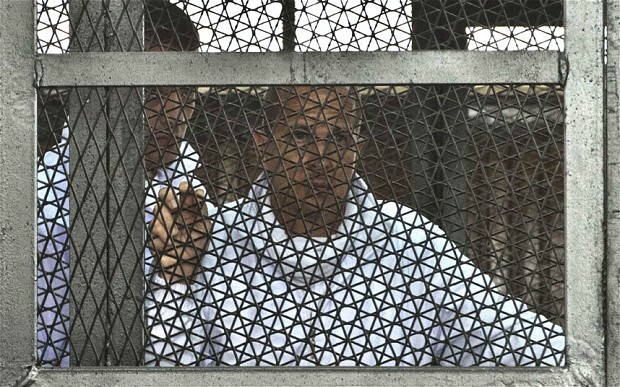 Australian journalist Peter Greste has been jailed for seven years for committing the crime of journalism by reporting the news and “defaming Egypt“. Channel 7’s Kerry Stokes here is Australia is trying to have me jailed and has instituted contempt of court proceedings against me which is set down for hearing on the 15th of July. What for? The crime of journalism and reporting the news in regards to Stokes defamation proceedings against me. This is almost exactly the same as the injustice done to Peter Greste. Kerry Stokes statement of charge – Notice of motion – Affidavit of Stokes dodgy Lawyer – Judgement of Justice Harrison in the suppression order hearing which failed for Stokes. Kerry Stokes went to court on the 14th of April and instituted defamation proceedings against me. He also had the duty judge, Justice Harrison, put a suppression order on the case without my knowledge. Stokes lawyer notified me on the 15th of April. I published an article on the 16th letting the readership of this website know as it seemed very dodgy which is it was. The suppression order lasted until the 17th when we were in court to argue whether there should be a suppression order. Harrison handed down his judgement on the 24th of April and Stokes lost. So Stokes wants me charged for breaching a suppression order that should never have been issued in the first place as Justice Harrison found there was no legal basis for one in his judgement. Why did Stokes want a suppression order for anyhow, is he ashamed of what he is doing? And his lawyers knew Stokes was not entitled to a suppression order as they are meant to be experts in that area of the law and would have known. They had to lie to Justice Harrison to get one for a couple of days and that is all it lasted. A couple of weeks later Stokes was back at it again with another Ex Parte application. This time with Justice McCallum who as it turns out knows Kerry Stokes lawyer Justine Munsie really well. The transcript is only three pages long and a must read. McCallum admits she should not be hearing the case and there is no justification for it yet still gives Stokes what he wants at the end. (Click here to read the transcript which I had to buy later as they were all trying to cover it up) Stokes is a big fan of Ex Parte applications that way only Stokes arguments are heard and the Supreme Court is happy to help Mr Stokes. This is what Chief Justice Gibbs of the High Court of Australia said in (J.R.L. ; Ex parte C.J.L. HCA 39; (1986) 161 CLR 342 F.C. 86/038) in regards to the type of communication Kerry Stokes had with Justice Harrison and Justice McCallum. What is Stokes trying to achieve? Is he trying to intimidate the media so they do not report on him? Imagine if someone tried doing to Stokes or one of his employees what he is trying to do to me. Stokes and Channel 7 would be screaming all over the place about the great injustice and how corrupt the courts are. Stokes can hardly say he doing what he is because he has great respect for the law. In 2007 a federal Court judge, Justice Sackville accused the Channel 7 boss Kerry Stokes of giving “deliberately false” evidence. (Click her to read more) The case was the infamous C7 case where Stokes sued over 20 companies and lost and had to pay over $200 million in legal fees. Just in the C7 case alone Stokes should have been declared a frivolous and vexatious litigant and banned from future court proceedings. I written to Stokes and his lawyers letting them know I want to question Stokes in court at the hearing. Stokes and his lawyers are ducking and weaving and will not respond. If Stokes does not show up I will ask the judge to charge him with contempt of court. I think Stokes believes he is above the law and does not have to show up. He must also be worried that another judge might find that he has given ““deliberately false” evidence. Do innocent people go to jail in Australia? The David Eastman Inquiry report was handed down a few weeks ago and it found that David Eastman, who has spent 19 years in jail, was denied natural justice and a fair trial and should be released. The prosecutor in the Eastman trail 19 years ago was Michael Adams who is now a Supreme Court judge in NSW and as corrupt as they come. He is currently suing Fairfax Media because they wrote about him acting corruptly during the Eastman trial. I will write more about Adams in the very near future and I have written about Eastman before (Click here) although the most recent post I was forced to take down by Michael Adams in his role as a judge. He in effect heard his own case. (Click here). Eastman is still awaiting release. The bottom line to the Peter Greste jailing is injustice. While we should fight and fight hard to get Peter Greste out of jail injustice is also done here in Australia as the Eastman matter shows and how many people are fighting to get him out of jail. What has happened in Egypt is bad but it happens here as well, just not on the same scale. On the 15th of July it will not only be me on trial, it will also be the Supreme Court of NSW and we will be able to see exactly how corrupt they are. It will be in Sydney and the matter name is Munsie v Dowling as Stokes did not want his name on it so he used his Lawyers. Come and watch if you have time. This is an issue that should concern all Australians because tomorrow it could be you being denied natural justice. it would be a fantastic idea of a large number of people turned up to court in support. That is the only way we can force change and take the courts back to a constitutional court, unlike the star chambers we have today. Forge V ASIC has been completely ignored and i think it is up to the public drive it.. as apathetic is we are. This comment may be a tad “off” but for a while now I think of Oscar Wilde’s “A Portrait of Dorian Grey” whenever I see Kerry Stokes. He was a fine looking young man but now I think every horrid, illegal and unpleasant thing he has done is showing on his face. He is not a happy man and until he stops his nit-picking one-up-man-ship and absolute greed, he will continue to slide downhill. How come when I google this, there seems to be even less than there was a few weeks ago, is kerry effectively shutting it down? Kerry Stokes is a bully. I agree with Glenn. This is outrageous behavior. Talk about bad timing, I guess Kerry Stokes never thought about that side of the equation did he… ??? What is our Justice system coming to? If i was a billionaire i would be sitting in the sun in the Bahamas somewhere sipping a wine – The ego of Stokes – unbelievable – and corrupt judges – it is time they were removed from the bench. If I were in N.S.W, I would most CERTAINLY be in court to support you!! Hopefully, justice will prevail! As a wog, I feel privileged to live in this Australia of ours, and fervently hope that our system doesn’t go slipping and sliding into the Medieval darkness of an Egyptian court!! God bless you Shane, and keep up the good work of keeping them honest! I am sorry to hear about your predicament with bully Stokes Shane but you have plenty of support from your followers I am sure that justice will prevail in spite of the bent establishment in Sydney. All over the world there is concern over the power the establishment wields,it is hard to believe that in most cases it is the democratic nations that get the knocks.The case of Peter Greste is an example, and the Rebbeca Brooks case is laughable there is definitely some political intervention that is not actually divine, You like all of us are vulnerable to establishment dirty tricks and you are one of us who is brave enough to do something about it. Best wishes in your battle of principles. Allan from Myalup.WA. It is quite apparent that Kerry Stokes has gone past his useby date, with age comes stoicness or sensitivity, it is apparent he has the latter and to much money and deceitful legal connections. is no such thing as a prime minister in the Australian constitution. WHY? They just don’t have the guts to fight it out man to man! Now we follow the yanks! Sue! Sue! Sue! What a great country and what great MP’s and Businessmen we now have! Greatest bunch of whimps who ever drew breath! Perhaps the only way to fix the corruption problem is for the judges to be elected by the people (us schlebs) and only for fixed terms where they have to run again in an election and justify their decisions and behaviour to us the voters. If they act corruptly then that can be bought up at election time (just as you have enlightened us on many occasions with many judges/magistrates) and let the people decide if they are willing to accept this bad, biased and often corrupt behaviour. It will not clear up the whole problem but at least they may think twice before making bad decisions. Elections can be run at the same time as State or Federal elections. Just a Thought!